Uh, oh…the clash of ice and warmth brings storms | Watts Up With That? Snow as the first week of April drew a close was still extensive across Canada and Asia. It remains well above the normal as it did the entire winter. Meanwhile the Gulf of Mexico has warmed above normal due to the southeast ridge the last 6 weeks. 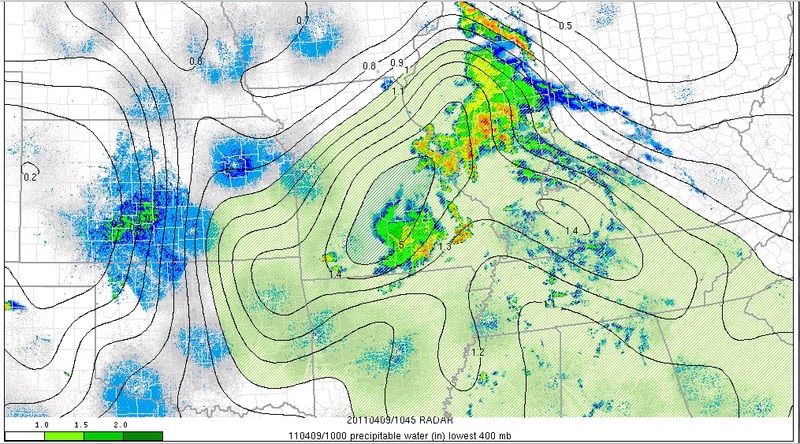 The means more then normal north to south contrast and moisture aplenty to help feed spring severe weather activity. Normally La Nina springs have more severe weather activity as have posted earlier. 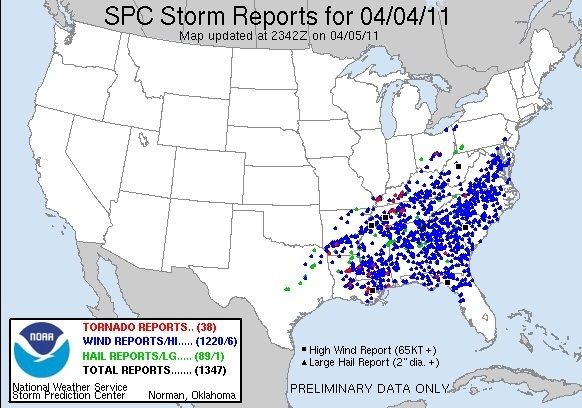 Last Monday, April 4th was one of the most active days in recent memory for the Storm Prediction Center and folks who live in the southeast with 1347 severe weather reports (1220 high wind, 89 hail and 38 tornado) from the Ohio River southeast to northern Florida. Virtually everyone in the southeastern United States felt the fury. See this link for a listing of all the 1347 reports. April and May should keep forecasters busy. In my first WeatherBell post, I discussed the potential for some very big severe weather days as is the case in La Nina years in a cold PDO (Pacific Decadal Oscillation). The Palm Sunday outbreak in 1965 and the Superoutbreak in 1974 were just two prime examples. 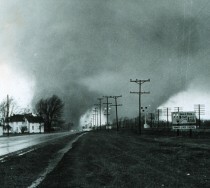 The Palm Sunday tornado outbreak on April 11, 1965 involved 47 tornadoes (15 significant, 17 violent, 21 killers) hitting the Midwest. It was the second biggest outbreak on record. In the Midwest, 271 people were killed and 1,500 injured (1,200 in Indiana). It was the deadliest tornado outbreak in Indiana history with 137 people killed. The outbreak also made that week the second most active week in history with 51 significant and 21 violent tornadoes. The tornado which hit Midway trailer park is disputed to be an F5, as 25 homes were literally and figuratively wiped off the face of the earth, with no signs of them ever found. NOAA image for the famous Elkhart, IN double funnel tornado that hit the Midway Trailor Park. 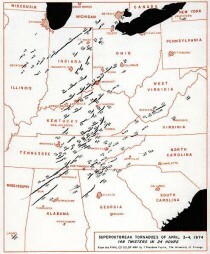 The Super Outbreak of April 3-4, 1974 spawned 148 confirmed tornadoes across eastern North America and resulted in the second highest death toll (319) in the United States. Not only did it produce an exceptional number of tornadoes, but it was also an inordinately intense outbreak producing dozens of large, long-track tornadoes, including 7 F5 and 23 F4 tornadoes. More significant tornadoes occurred within 24 hours than any other week in the tornado record. Severe weather is likely today and tomorrow with moderate risks both days. You can see the moisture (precipitable water – total water in inches in the atmospheric column) in this early Saturday analysis with the radar showing showers and thunderstorms. See more on WeatherBell posts by Joe Bastardi and I. ← "Snow" in Fairfield California – Gore effect? just saying that this has been the warmest start to April that I can remember, going back to the 19690s. My base is London UK. Serioulsy, this is the warmest Spring i can recall. I never turned off my heating this early before. 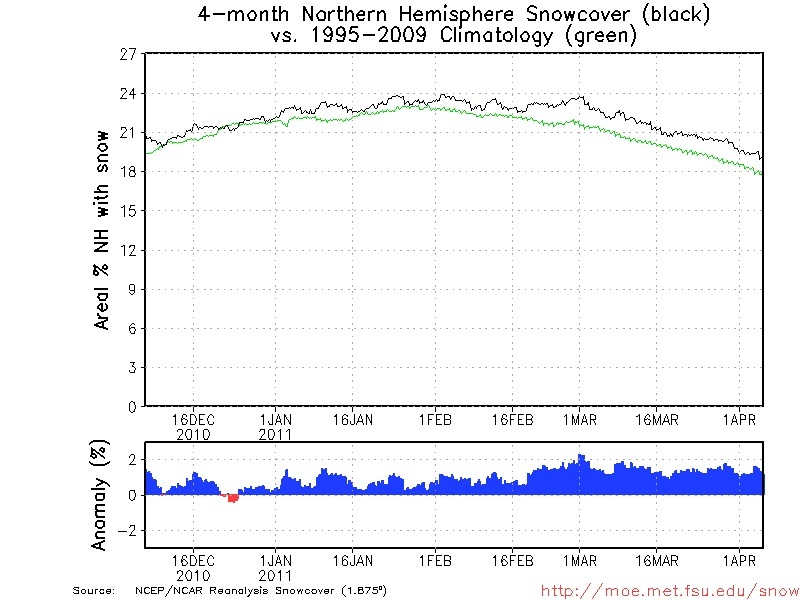 For snow cover in the NH, we have about a 5.5% above average situation, if I read the graph correctly. Is that significant? What is the last 15 years variance from average? It may be warm in the UK but it is pretty cool here in Oregon! Sorry Diogenes, but NOAA says that this March has been the coolest March in 15 years. We seem to be having some cold weather this weekend in Silicon Valley as well, although we had some warm days in he last days of March or perhaps earlier last week. Until today, we were averaging 10-15 degrees below normal since March 1st. There is plenty of snow in the woods, and I have a mound 3′ tall from where the plow guy pushed it up. My small pond still has 4-6″ of ice. It has been a near-record cold start to spring here in Northern Vermont. I wish all the best to Joe and Joe and WeatherBell! I never turned off my heating this early before. Are you saying that’s just weather? Or are you a global warming believer and you’re desperate for good news? I look forward to being a regular visitor to the WeatherBell. Thanks for the article Mr D’Aleo. My best guess would be about 19.0 – 17.8 = 1.2% above average. Yesterday morning everything around was covered by snow in South Colorado. The snow melted quickly, though. Today, everything is covered by snow in the evening, and snow doesn’t melt. Al Gore must have flown over our cuckoo’s nest. @ diogenes. In my little corner of south-east Kent, the warmth of the Sun has been more than cancelled out by a cold, moist easterly/ north easterly wind coming off the North Sea, keeping temperatures well below barbeque minima. Flora in the greenhouse is flourishing, to be pulled back a couple of weeks when set into the still-cool soil. The old English saying of, “Cast not a clout ’till May be out”, in modern parlance, “Don’t go knickerless ’till June”, could well be good advice to follow this year. Yes, here in the UK we are having (at last) some really nice Spring weather. And of course the hyperthermalists are already turning cartwheels and bouncing off the walls. 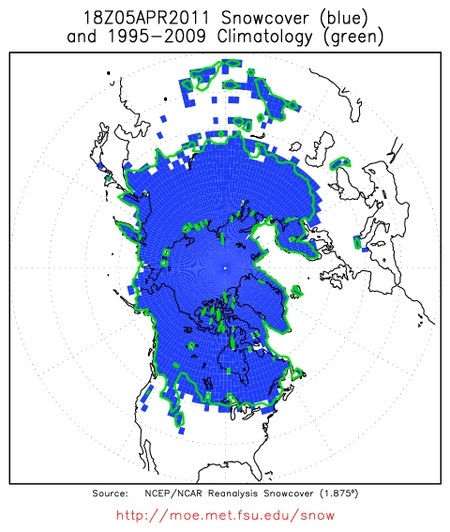 Curiously I have seen absolutely no MSM mention of the weather conditions in the Gulf of Finland / Baltic Sea! Strange that! 76 ships stuck in ice, ten icebreakers working overtime and not a whisper! It’s almost as if they were hiding something. I wonder if R. Gates knows. Thirty years ago, to the day and to the weekend, it was as warm and sunny in the UK as it is now. Interesting how the sea surface temperature map of the cold tilts and moves with the change of the planets axis. Come, come, surely you know that it refers to Hawthorn flowers, aka Mayflowers or just May. Interesting that the April 2011, snow cover area is 6.6% bigger than the 1995 – 2009 average. 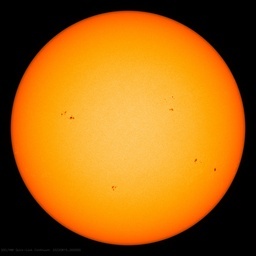 I wonder if the lack of solar activity has anything to do with this? 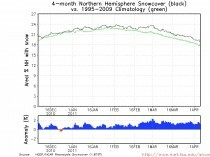 This increase in snow cover will cause more of the weak sunlight to be reflected into space and lead to a later start to the growing season. Not good news! Many long time (50 years and more) residences in Wallowa County have to search their memory for a colder Spring. Yesterday an elderly couple stated that they are down to one wood fire per day, as they are afraid their wood pile will run out before the cold does. We are looking at at least one night time temp in the teens this next week, and snow once again on the valley floor here. In an economically depressed and sub-par energy delivery infrastructure area, a late Spring can bring back memories of coffins during similar historical events. At least back then, wood gatherers could avail themselves of energy sources. Now, the easily assessable Federally protected forests are off limits to such endeavors. The wood energy that could heat the aching bones of our elderly lies rotting on the ground. “Ash logs, all smooth and grey. It’s been warm in the Spring sunshine, here in Yellowbelly Land (aka Lincolnshire), but things cool off rapidly as the sun gets low in the sky. Forecast for about 4C tonight. I spent one winter in Scotland and England. The nights were much longer than in New England. In fact, I was somewhat shocked by how swiftly the days grew shorter, and by November the sun barely seemed to rise before it was going down. By December it seemed the sun was only up at lunchtime, and it made life rough for a schoolboy like myself, used to fresh air and time-out-doors after school. The winter (1970-1971) was quite mild, compared to New England, but I found the darkness hard to endure. However the return of sunlight in the spring was completely wonderful. After much darkness, light is like a narcotic, or at least like wine. Ever since then I’ve thought people who live up towards the pole must all be seasonally bipolar. December depressions give way to June euphorias. So why not just enjoy a warm spell in April? Considering how cold and snowy December was in England, you certainly have earned some sunshine. Turn off the doom-sayers who can’t enjoy the warmth, and have to see the end-of-the-world in everything. Read some Keats and Shelley instead. Ref Caleb. You should have checked the latitude before leaving New England. 🙂 Keats to cheer you up? Start with “The Pot Of Basil”. It is interesting the lack of understanding there is out there about carbon cycles. Wood, left to decompose on the forest floor, will just as assuredly release its CO2 back into the atmosphere. By burning it in a woodstove we, at least, get to harness some of its heat energy. Alarmists, on the other hand, take a beautiful spring day, and make it morbid. Actually Keats is more focused on overcoming tragic situations, (Autumn and winter,) than on springtime, now that I think of it. However “A thing of beauty is a joy forever” is pretty nice, though very youthful and naive. (“Ode to Meloncholie” is the first version of “You gotta pay the dues if you’re gonna sing the blues.” ) What blows me away is the maturity he achieved before age 26. However all in all I’d say you are right. I’ll skip to “Ode to a Skylark” by Shelley.